Turning an Empty House into a Home! Adequate transportation to haul their selected furniture home. A list of truck rental locations are available on request. Please clean out your vehicle BEFORE coming to the furniture bank (i.e. trunks, back seats, truck beds, etc.) so that the furniture can be appropriately and safely placed in your vehicle! We have many scheduled appointments on any given day and it is unfair for others to wait while your vehicle is being cleaned out. We reserve the right to have individuals move their vehicle to the parking lot to clean it out and move other appointments ahead for these situations. Bring tie downs, bungee straps, rope, etc. to secure your furniture to your vehicle. In addition, for inclement weather conditions, please provide tarps, plastic, etc. to cover your load. 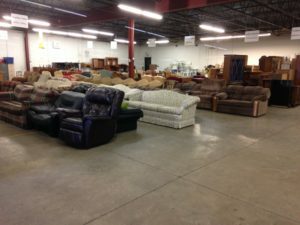 The furniture bank is NOT required to supply any of these types of items to secure/protect the load. Families are allowed 3 appointments in a 2 year period to get the furniture needed. One of the greatest concerns is for children who are sleeping on something other than a suitable bed. In an effort to remedy this situation we started a special program in 2017 to provide "Beds for Kids". The St. John Vianney Furniture Bank provides special beds for younger children ages 2-9, up to about 90 lbs. This is a NEW bed and consists of a metal bed frame with a 6" futon style mattress. Each of these special beds cost us $52 and are currently provided to the client for $20. We are working to raise adequate funds so that these beds could be provided at no cost. YOUR donation will help us achieve this goal.